Pictured is a rendering of the phase one site plan submitted by The Ohio State University for the planned Wexner Medical Center - Regional Ambulatory Facility to be located on Sawmill Parkway, directly across from Olentangy Liberty High School. The Ohio State University’s proposed medical center in Powell is one step closer to becoming a reality after the Powell Planning and Zoning Commission approved the final development plan at Wednesday’s meeting. OSU had been working for months to finalize the details of the proposal, and while still not completely there, the university gained the approval of the commission in a show of good faith. “Given that this is The Ohio State University … we can trust that they will continue to work with us to finalize the details that will ensure that we do introduce a world-class facility to the city of Powell,” commission member Bill Little said of the project. Both sides expressed frustration in what has become a lengthy, drawn-out process in getting a final development plan that still lacks the extensive details typically required by the city in final plans. However, the conversation consistently came back to OSU’s reputation and reassurance the remaining details will be handled appropriately. The first phase of the development, to be located near the northeast corner of Sawmill Parkway and Home Road, across from Olentangy Liberty High School, will include an ambulatory care center and medical office building totaling more than 200,000 square feet. Phase one is projected to employ at least 500 physicians and staff, with an estimated payroll that will exceed $50 million annually once the facility is fully complete. City staff expects OSU to initiate the first phase within two years of its approval, and completion of the project within five years. There is no timetable for when the second phase — a 90-bed hospital — would begin development. While there are still details to be finalized, Powell Director of Development Dave Betz pushed for a vote at the Wednesday meeting due to the approaching expiration date of the annexation plan, which is mid-February, for the plot of land, which currently sits in Liberty Township. Powell City Council requires two readings before approval. Several conditions were attached to the plan’s approval to ensure that any significant deviations from the current proposal, as well as all details that are still being finalized, come back before the commission for approval. Aaron Underhill, the attorney representing OSU on the project, said the development team has every expectation to come back before the commission with more details as they are finished, with or without the conditions being attached to the approval of the plan. Council will hold a special meeting on Tuesday, Jan. 29, which will include the first reading for the final development plan. Meetings begin at 7:30 p.m. The submitted final development plan can be viewed by visiting cityofpowell.us. 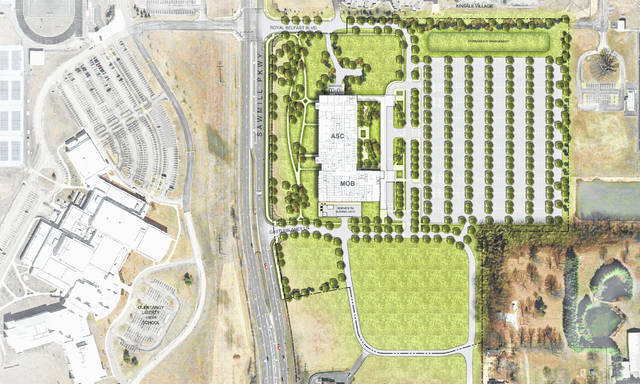 Pictured is a rendering of the phase one site plan submitted by The Ohio State University for the planned Wexner Medical Center – Regional Ambulatory Facility to be located on Sawmill Parkway, directly across from Olentangy Liberty High School.